No work on Wednesday due to other activities, and Thursday was packed too – but after I got home and put the kids to bed, I wanted to at least get in a little bit of work, even though it was almost dark. I had the monkey bars assembled, so I went ahead and attached them to the playset. This picture was taken the next day but shows the monkey bars. They just drill in to the playset and then there are stakes that have to be rotated and put in the ground (and then bolted to the base of the A-beam. The only tricky part was trying to get them level. Since we did not level out the ground before we started (though our ground is what someone from The Princess Bride might call “mostly” level), it’s always an adventure. Especially since we had dug and lowered the ground somewhat to get the main clubhouse set and level. 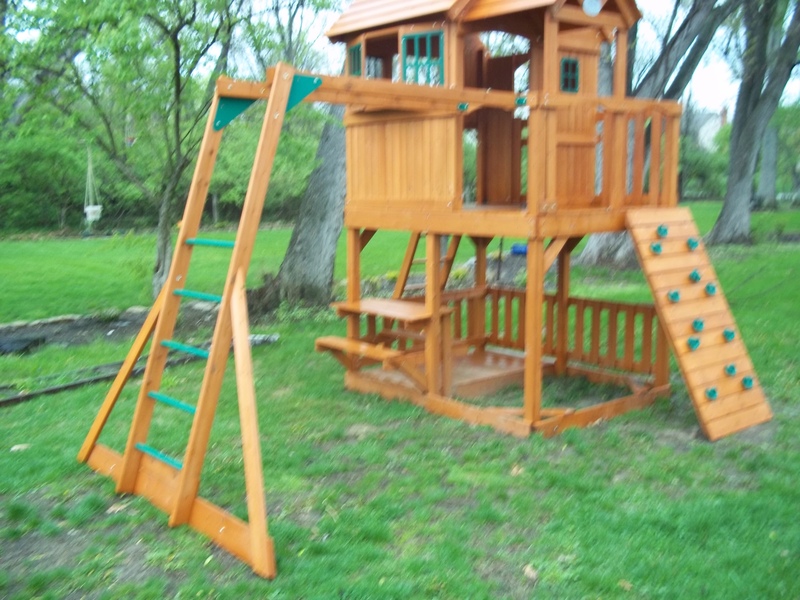 This entry (permalink) was posted on Sunday, April 24th, 2011 at 8:08 AM by Dan Miller and categorized in family, kids, skyfort playset. I need more posts from Dan Miller!